Do you notice something in common with all of these fruits of the Spirit? Each one of them is also a virtue! 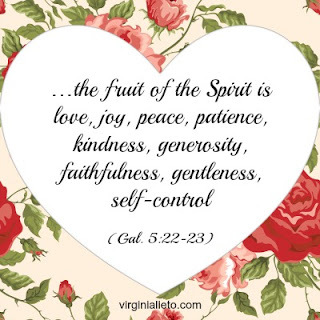 As I was studying for my Master of Arts Degree in Pastoral Theology, I came across this passage from Galatians, and it hit me: Virtue must be very important to the Holy Spirit, when six of the seven gifts of the Holy Spirit, received at Confirmation are virtues, and all nine of the fruits of the Spirit are virtues.